The developers of the vexed Pacific Park Brooklyn development (formerly Atlantic Yards) have quietly acknowledged–in a non-publicized document–that the full 22-acre project, with 11 more towers planned beyond the four already open, likely won’t be finished until 2035. The new deadline is 32 years after the arena-and-towers project was announced in 2003, with an estimated ten-year buildout, and comes after enormous changes in the project plans, project ownership, and the apartment market in and around Downtown Brooklyn. Given the earlier deadline for affordable housing, it’s increasingly likely that the developer will concentrate below-market units on the easiest parcels to build: the five development sites on solid ground. By contrast, six sites require an expensive deck over the Metropolitan Transportation Authority’s Vanderbilt Yard, where Long Island Rail Road trains are stored and serviced. “A full Pacific Park completion by 2035 reflects the buildout horizon allowed by the general plan,” a spokesperson for Greenland Forest City Partners said today in response to a query from The Bridge. “Our affordable housing commitments will be met by 2025.” The statement did not explain why the joint venture has not publicly announced this new expected timetable, or whether it has been shared with public officials. The 2025 affordable housing deadline was set in June 2014 as part of a seemingly triumphant settlement announced by Gov. Andrew Cuomo in response to community concern that 2035–the time at which the developer would be in default—gave too much slack to deliver the affordable housing, a chief selling point when Atlantic Yards was first approved in 2006 and re-approved in 2009. After concessions from the Metropolitan Transportation Authority and Empire State Development, the December 2009 re-approval came with an anticipated 10-year buildout, but with an acknowledgement of a potential five-year delay. However, the project’s Development Agreement, disclosed in January 2010, imposed deadlines only for the arena and first few towers, and set 2035 as an “outside date” by which the developer would be in default. That caused significant concern among elected officials and community groups wondering about the project’s claimed benefits, especially since Barclays Center had been up and running for two years, with no apartments finished. The 2014 settlement coincided with original developer Forest City Enterprises (now Forest City Realty Trust) selling 30% of the project, except the arena operating company and one tower, to Greenland USA, the U.S. arm of Shanghai-based Greenland Holding Co. The joint venture proceeded to change the project name to Pacific Park and to start three towers, two of them “100% affordable,” albeit skewed to middle-income units, compared to previous promises. 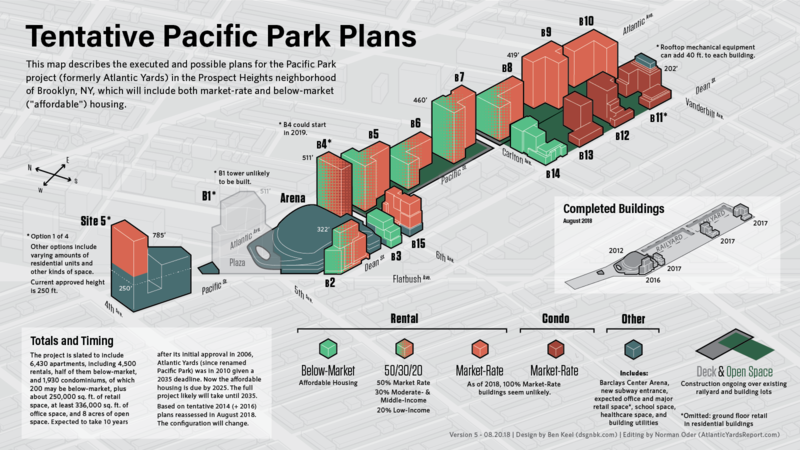 Over the past three years, though, Pacific Park has faced headwinds: a change in state tax policy, a glut in market-rate units nearby, and rising construction costs. In November 2016, Forest City announced it would delay future development. A seeming disagreement between Forest City and Greenland percolated, with a restructured joint venture announced in January 2018. Going forward, Greenland will own and fund 95% of the remaining project. The 14th Amendment to the 550 Vanderbilt Offering Plan, submitted May 23 to the state Attorney General and acquired via a Freedom of Information Law request, offers some transparency. It states that “the remaining buildings, and the balance of the public park, [are] projected to be completed in phases by 2035,” with even that deadline hedged. Not only has Forest City Realty Trust (parent of Forest City Ratner Companies, now Forest City New York) essentially withdrawn from the project, but that company is slated to be absorbed by Toronto-based Brookfield Asset Management, according to an agreement announced July 31. Former Forest City executives in a new company, L&L MAG, will continue to represent the project to public agencies on behalf of the developer. It’s unclear whether the new timetable has been shared with any elected officials or members of the city’s community boards. Representatives of the developer have generally been guarded when asked about deadlines. 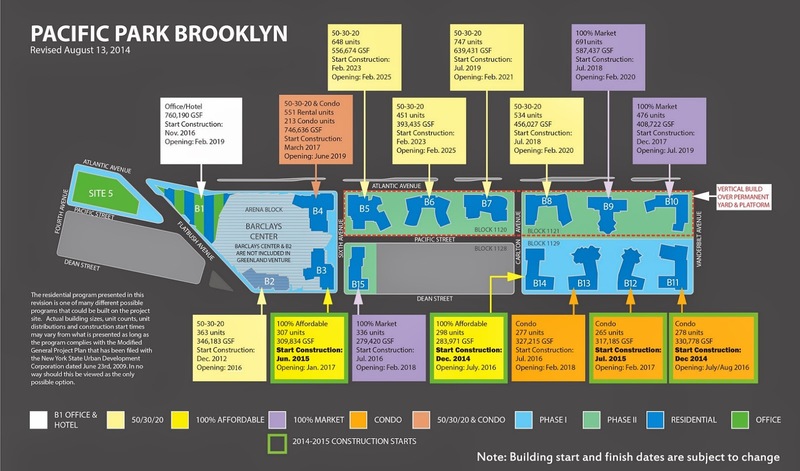 At a January 2018 meeting of the Atlantic Yards Community Development Corp., a state advisory body, Greenland USA project manager Scott Solish was asked about producing an updated building-by-building timetable. A timetable would be shared, he said, “probably sometime later this year.” At the time, the joint venture announced planning for one tower: the giant building known as B4, at the northeast corner of the arena block, which could contain more than 750 apartments. (That’s the total for the Hub at 333 Schermerhorn St., currently the borough’s tallest building.) The B4 tower could launch in the second quarter of 2019. His statement was based on the assumption, going by the previous timetable, that Greenland Forest City intended to build the project by distributing the required 2,250 affordable units throughout most of the project buildings, including the last few to be built. But building eleven towers in seven years would be a stretch; 17 years offers more of a cushion in the real-estate market. At the May meeting, Solish said Greenland was planning for development on the “land sites” as well as plans for the railyard deck, and would share details in the future. Fifteen days later, Greenland Forest City filed the updated disclosure with the attorney general’s office. The plans, and expectations, for Atlantic Yards have changed enormously. When the project was approved in 2006, at the height of the real-estate market, the buildout was optimistically scheduled to happen in a decade. 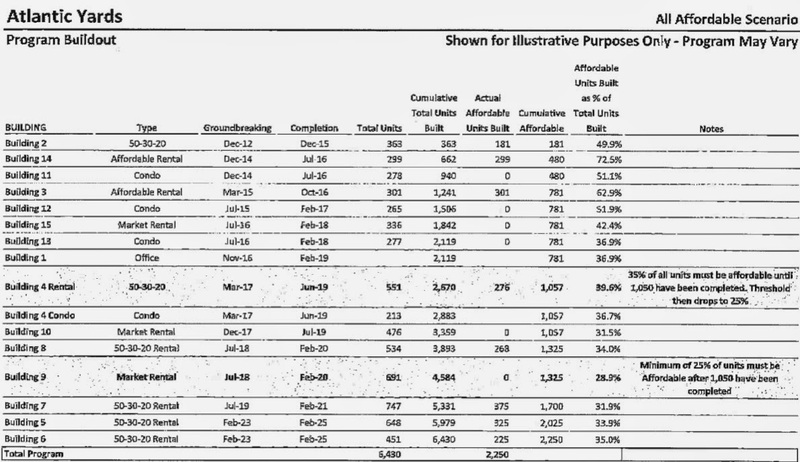 Despite the onset of the Great Recession of 2007-09, developer Bruce Ratner wrote an op-ed in May 2008 estimating project completion by 2018. Instead came the 2009 and 2010 documents and the slow start of a single tower, built via modular technology, which took far longer than planned. After the 2014 settlement, three towers did start; two others–one containing a school at its base–were announced, but didn’t launch, in part because of the market headwinds at the time. In November 2016, when Forest City announced the pause, it didn’t project any new deadline; however, an executive said their new financial model extended until 2035, which implied that project construction would continue, at least, until the 2030s. Now Greenland Forest City can no longer expect to build, as planned in 2014, some of the buildings as fully market-rate rental and condo units–and still get a tax break known as 421-a. “So most if not all the buildings will include affordable units, which is part of the ongoing ability to meet all of our obligations to the state and for the project,” Solish said at the meeting in May. That raises an intriguing possibility: if the developer meets the 2025 deadline for affordable units, Pacific Park may wind up including more below-market apartments than originally promised. The project agreements with the state include significant fines for delay, though such agreements have been revised in the past. Greenland USA’s long-term involvement is not set in stone; while it has bought nearly all of Forest City’s remaining share–the cost remains undisclosed–the company has pulled back from two proposed projects in California, and is seeking to sell part of its other major project, Metropolis, in Los Angeles. Copyright © 2017 The Bridge. All rights reserved.